Cellphones have already muscled onto watches' turf as a time-telling tool. Now, some of the biggest technology companies are eyeing your wrist, too. Companies like Apple, Nike and Sony, along with dozens of startups, hope to strap a device on your wrist. It's quite a disruption for the wristwatch, which has not actually been around all that long. Though said to have been invented in 1868 by the Swiss watchmaker Patek Philippe, it didn't really catch on until after World War I. Before that, people carried watches in their pockets or on chains. "Watch manufacturers were asking themselves this in the 1900s, if it made sense to have a watch in their pocket," said Blaise Bertrand, industrial design director for IDEO, a design company. "I think that's the same question that is being asked now, but it's in a completely different context with the smartphone in our pockets." 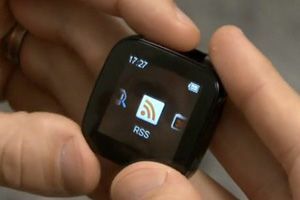 The new wrist devices won't replace smartphones, but rather connect to them. Most will continue the basic task of telling the time, while eliminating the need to dig a smartphone out of your pocket or purse. But they will provide far more information than the most advanced G-Shock watch available today, or the most expensive chronometer. For example, Sony this year released the Smartwatch, a 2-inch-square screen that can display emails, Twitter posts and other pieces of text, all pulled from an Android smartphone. Nike Fuel, a black band with an array of colored lights, measures the energy you exert on a daily basis and sends it to a smartphone. Jawbone sells the Up, a unisex bracelet that tracks a user's daily activity and sends the information to an iPhone application. Pebble, an innovative watch that can play music and display text, the weather and other information from a phone, caught the public's imagination on Kickstarter, where it raised $10.3 million. It's expected to arrive next year. It is the extension of the phone that is appealing. "The wrist becomes a remote screen where you now have the ability to control your phone with a number of different applications," said Stephen Sneeden, Sony's product marketing manager.